Many people heading to the Olmsted Hydroelectric Power Plant’s open house on Sept. 19 will look at its future in preserving water for coming generations. Paul Pierpont comes to it with a different perspective. As the Bonneville Unit manager for Central Utah Water Conservancy District, he will carry on a family legacy, overseeing the crews that keep the recently completed $42 million complex at the mouth of the Provo Canyon in operation. Back then, Pierpont heard from his mother, Carilyn Miller Pierpont, that local high schools would hold their dances at the complex and parties revolved about the barbecue whose foundation still stands. Kids would sneak into the big map room for a game of pool, and many found their mates among other families that called the complex home. That was the case with his parents, who first met on the grounds. 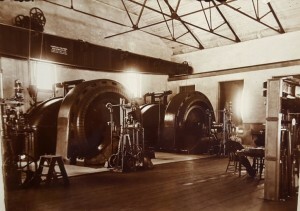 The power plant made history from the start, an extension of the direct-current Colorado plant Ohio lawyer Lucien Nunn built to power the gold mines. He built Nunn’s Plant in Utah in 1897, harnessing the Provo River to deliver an alternating current of 40,000 volts, transmitted 32 miles to the mining town of Mercur. It was the first system of its kind in the world. His brothers Paul and Fay (Fred) Deveaux Olmsted helped; it was Fred who designed the plant that would later carry his name. Sadly, he died of tuberculosis before it was completed. Later, when Nunn couldn’t find qualified electrical engineers to carry on his work, he established the Telluride Institute on the grounds, where he trained his employees. 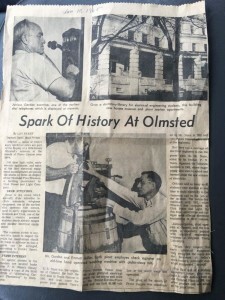 And during the Depression, the Olmsted complex included a House of Ideas where thousands of people could see the wonder of electricity in action. For many, the iconic operation is remembered most for the huge three-mile wooden flume that brought water to the penstock before it was replaced by steel piping in 1949. And now it begins another chapter! The new facilities include a relined 102-inch pipeline, a rock tunnel lined with an 84-inch steel pipeline, a cliff spillway structure, a surge tank, an 84-inch buried penstock, a power house with all hydroelectric equipment and connection to the electrical grid. 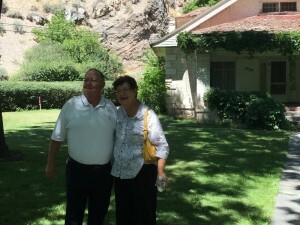 The open house, which includes a dedication of the new Olmsted Hydroelectric Power Plant at 1426 East 750 North in Orem, is open to the public from 5 to 7 p.m. Sept. 19. It is free but tickets are required. Request tickets through centralutahwater.eventbrite.com. Tours of the facility will begin every 10 minutes.